the AUTO-CINEMATIC Video Mix Tape, coming soon to DVD- order NOW!!! 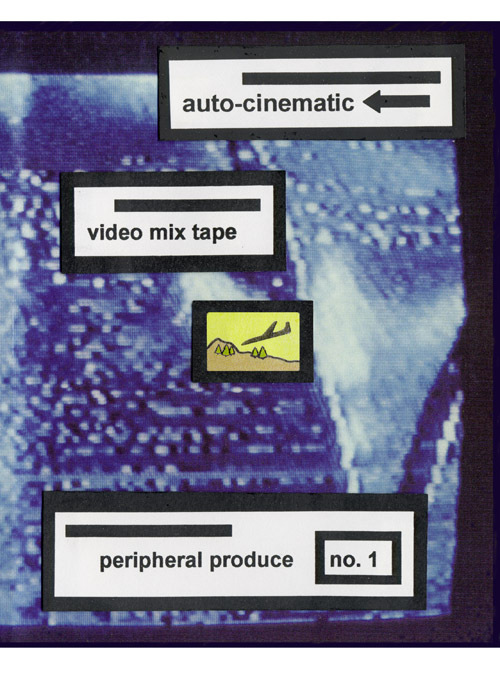 The original, first ever Peripheral Produce video compilation- originally released in 1998 on VHS tape, featured twelve short experimental films and videos. Out of print for the past few years, the AUTO- CINEMATIC Video Mix Tape is being re-mastered and re-released on DVD. Featuring work from MIRANDA JULY, NEGATIVLAND, JON RAYMOND, VANESSA RENWICK, ANIMAL CHARM, MATT McCORMICK, and MORE, the Auto-Cinematic Video Mix Tape looks back at what was happening in and around the mid-90s Portland experimental film community. The DVD hits the streets July 31 so PRE-ORDER NOW!!! To celebrate we will have a release party and Peripheral Produce retrospective screening at The Hollywood Theatre on Saturday August 4, 2012. JUST LIKE OLD TIMES!!!!!!!!!!!!!! This entry was posted in news and announcements by peripheral produce. Bookmark the permalink.